I wanted to serve some type of potato dish to pair with the slow roasted beef with creamy horseradish sauce I was serving for dinner. 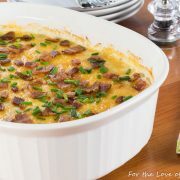 My husband requested scalloped potatoes so I used the America’s Test Kitchen version but added some bacon crumbles and fresh chives to the top right before serving to make them extra special. The potatoes were rich, creamy, decadent, and so delicious and they paired very nicely with the tender beef. 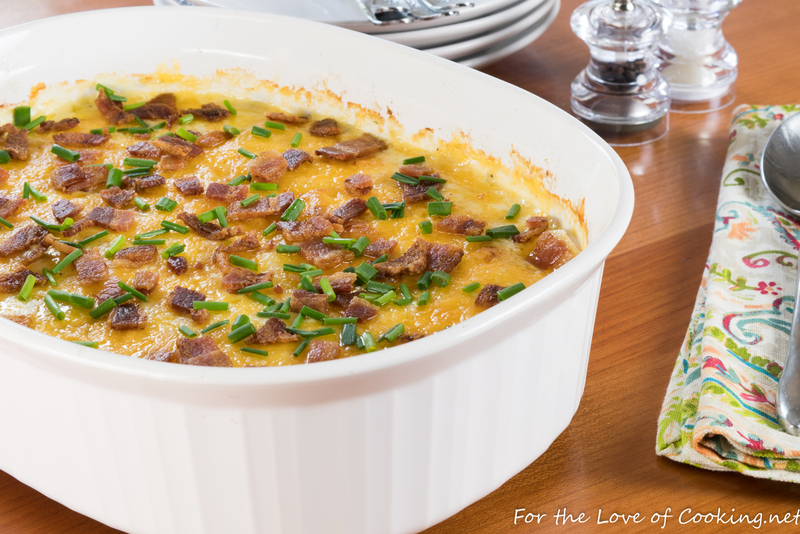 These scalloped potatoes with bacon and chives were a big hit with my entire family. Melt the butter in a large Dutch oven over medium-high heat. Add the onion and cook, stirring occasionally, until soft and tender, about 4 minutes. Add the garlic, thyme, sea salt, and freshly cracked pepper, to taste, and cook, stirring constantly, for 30 seconds. Add the sliced potatoes, chicken broth, cream, and bay leaves then bring to a simmer. Cover, reduce the heat to medium-low, simmer until the potatoes are almost tender (a knife can be slipped into and out of a potato with some resistance) about 10-15 minutes. Discard the bay leaves. Pour the mixture into an 8 inch baking dish that’s been coated with cooking spray. Sprinkle the top evenly with cheese. Place into the oven and bake until the cream is bubbling around the edges and the top is golden brown, about 15-20 minutes. Cool for 10 minutes then top with crumbled bacon and freshly snipped chives. Enjoy! 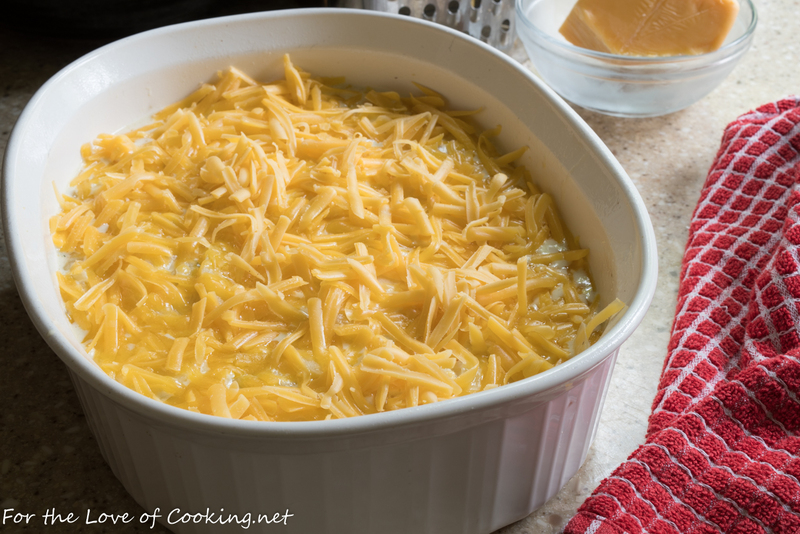 Melt the butter in a large Dutch oven over medium-high heat. Add the onion and cook, stirring occasionally, until soft and tender, about 4 minutes. Add the garlic, thyme, sea salt, and freshly cracked pepper, to taste, and cook, stirring constantly, for 30 seconds. Add the sliced potatoes, chicken broth, cream, and bay leaves then bring to a simmer. 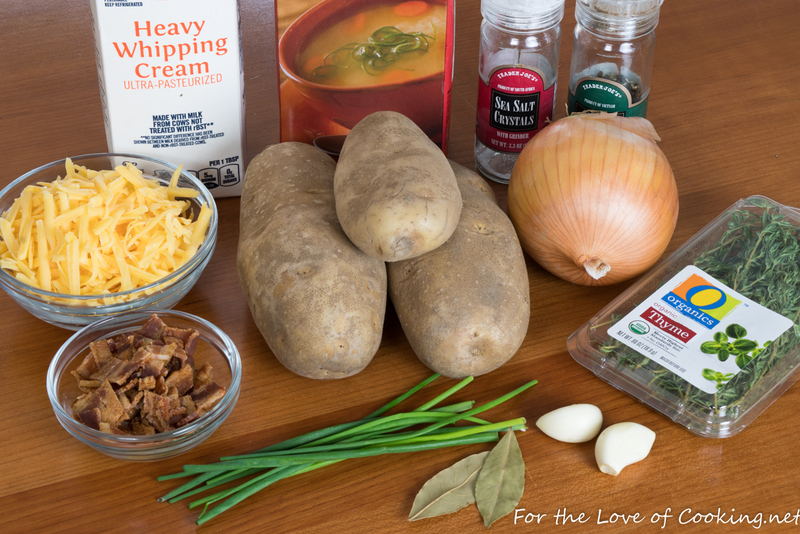 Cover, reduce the heat to medium-low, simmer until the potatoes are almost tender (a knife can be slipped into and out of a potato with some resistance) about 10-15 minutes. Pour the mixture into an 8 inch baking dish that's been coated with cooking spray. Place into the oven and bake until the cream is bubbling around the edges and the top is golden brown, about 15-20 minutes. Cool for 10 minutes then top with crumbled bacon and freshly snipped chives. Enjoy! This looks utterly delicious and so moreish! This was really easy to make. I had tried this and really came out well than i actually expected. I haven’t had any idea that my first try would be that perfect. It took me little time to prepare this and the result was awesome too. . My most favorite hobby is trying out new recipes. Since I’m engaged in my work at I don’t get much time now a days to tryout everything posted here but I had tried most of them and almost all came out really tasty at my first try itself. Yummy potatoes. I bet it went so well with the beef. Great recipe. 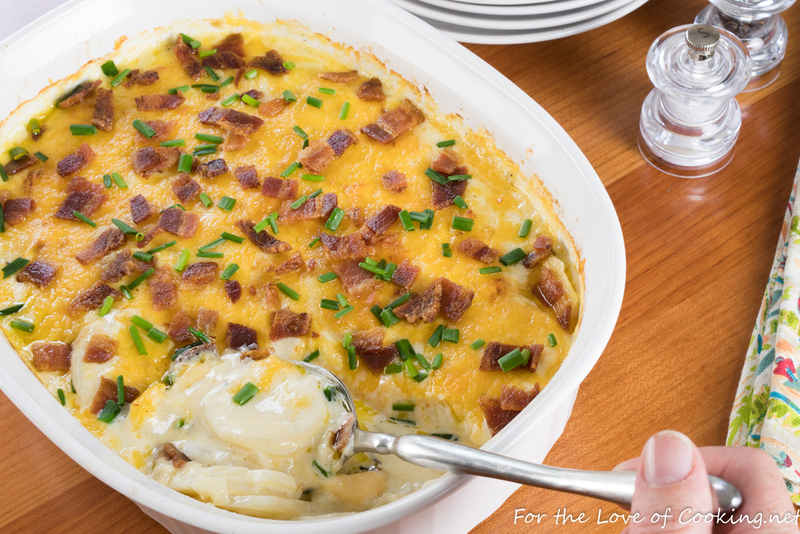 my mom makes the best scalloped potatoes i’ve ever had, but she’s never added bacon–yum!